This is the most frequently used defense in club and grandmaster levels, thanks to the complexity and ideas of pawn structures. After little efforts from your side, you’ll be able to use it and break down the resistance of your opponents. The Sicilian is an aggressive opening system, and with it, you can manage to defeat even stronger, sometimes titled, players than you! This is the KEY reason why we decided to create this new course, called “Master Sicilian Pawn Structures”. The author of this course is Mateusz Kołosowski, who is an International Master and a very successful chess trainer from Poland. He will guide you through the Sicilian pawn structures and he will help you understand all the main ideas of all of the main lines in this particular system. 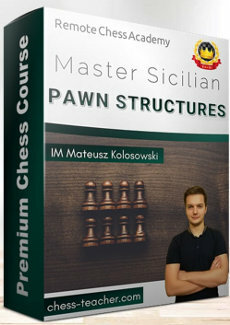 Here is your chance to grab your copy of “Master Sicilian Pawn Structures”! This course alone is enough to significantly boost your rating – and helps you win a lot of chess tournament trophies! Everything you need, whether you’re an ambitious person who is improving or a fan of chess, is in the course.